To be honest, cheddar bay biscuits are our main reason for going to Red Lobster. But sometimes we don’t want to go out to enjoy our favorite foods, and that’s where this recipe comes in! Our cheesy biscuits are flaky, perfectly seasoned and, with the help of bisquick, they come together in no time. And since they’re drop biscuits there’s no need to roll out any dough, or wait for it to rise! 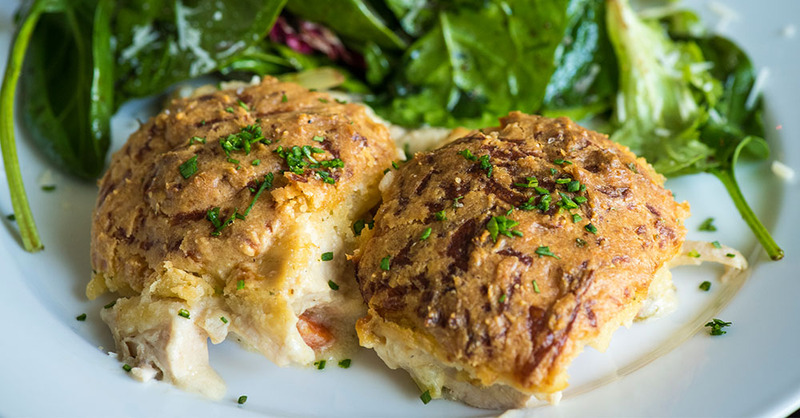 To turn these buttery biscuits into a full-blown meal, we baked them on top of a creamy chicken mixture to create a comforting casserole the whole family loves. Start by preparing filling: melt butter and olive oil in a large skillet over medium-high heat and sauté carrots, onion and celery until just tender. Add garlic and cook for 1 minute, or until fragrant, then sprinkle flour over the veggies. Stir and cook for 1-2 minutes, or until flour has cooked and has absorbed most of the moisture in the skillet. Stir continuously and pour in chicken stock and half-and-half. Add chicken and Worcestershire sauce, then season with salt and pepper. Cook for 10-12 minutes, or until thickened, then pour into greased 9x13-inch baking dish. For the biscuits: combine bisquick mix with milk, melted butter and garlic powder and stir together. Fold in cheddar cheese, then roll dough into small balls and place on top of chicken filling. Place in oven and bake for 40-45 minutes, or until biscuits are springy to the touch and chicken filling is bubbly. While casserole bakes, combine topping ingredients in a small bowl. Remove baking dish from oven and immediately brush biscuits with seasoned butter mixture.